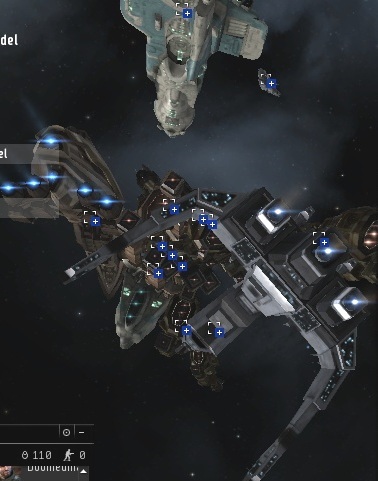 The New Order responded to my "call to bumps" in Halaima on Sunday, assembling a fleet and helping out the local miners while we waited for everyone to arrive. 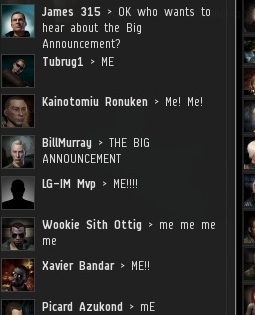 The question on everyone's mind was, "What is the Big Announcement?" 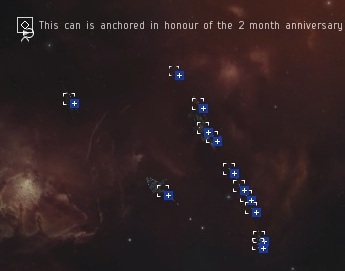 We attempted to create a conga line near the two month anniversary container, which was anchored during the last party. It isn't as easy as it looks! Finally, it was time for the truth to be revealed. Based on the timing, some had already guessed the Gallente Ice Interdiction might have something to do with it. 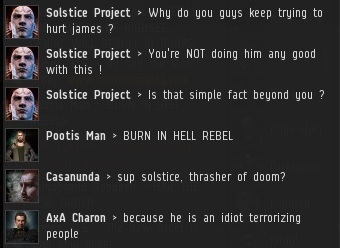 For those unaware, GoonSwarm and friends have prepared another campaign of miner ganking in Gallente highsec. The disruption caused by this event presents us with an invaluable opportunity to spread our message and bring more miners to the Code. 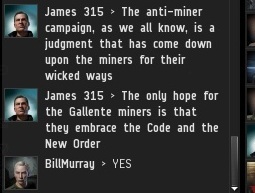 Every miner must know that his best hope for survival in highsec is to follow the Code and join the New Order. 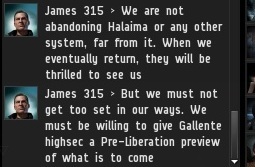 The New Order is relocating to Gallente highsec! For the duration of the Gallente Ice Interdiction campaign, that is. This move is entirely distinct from the normal way we do things. We'll return to our traditional New Order territories after this is all over. Halaima miners suddenly began to realize what this meant--bumpers leaving! 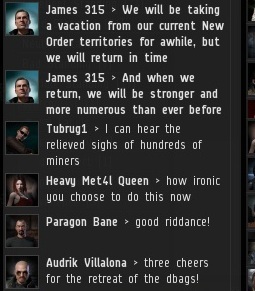 They may be happy about it now... But they'll be thrilled when we eventually return. Our headquarters will be the Tolle system in the Everyshore region. I'll be drawing up some maps later, but for now everyone who wants to bump should live in Tolle. There are also ice fields in two systems immediately next door to Tolle: Carirgnotten and Aydoteaux. With the order given, our ball of bumping ships warped away, burning to Tolle. 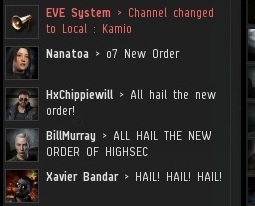 Naturally, as our parade went from system to system, many huzzahs were had. 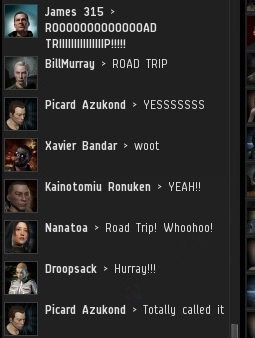 The excitement steadily grew as we approached our destination. Agents of the New Order were filled with zeal and fervor. 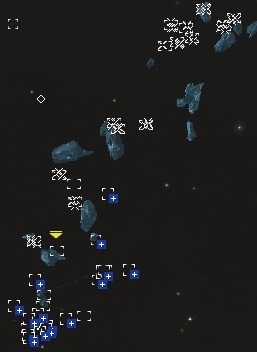 Our fleet passed through an "incursion" area, and Agents hailed the New Order even in the incursion channel, where mission-runners Solstice Project and AxA Charon were unamused. At last, we arrived in Tolle. 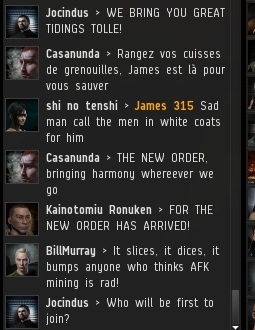 The miners were shell-shocked, totally baffled by our presence. Two dozen bumpers landed in the ice field of Tolle and went to work. Look at all that blue ice. The sight of Gallente highsec's blue ice will take some getting used to, in the same way the miners will need to get used to the New Order. There is so much we can learn from each other. Got suicide ganked by some wannabe in a Catalyst :D, an untanked Thorax melts easily but the platinum insurance made it worthwhile. 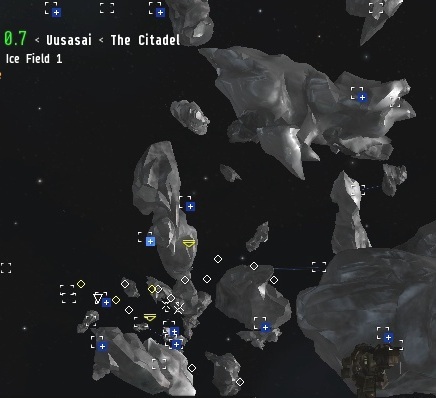 I think I should mention that we of the New Order do not take from cans, if you want to fire at us please feel free to so so, CONCORDs killboard needs padding. 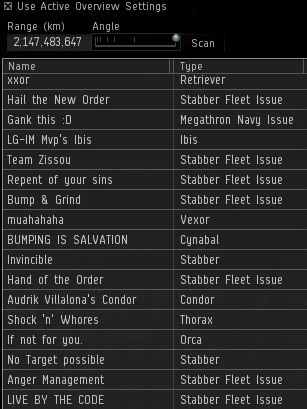 Got bumped by some wannabe in a Thorax :D, a slow barge bumps easily but the fact that bumping doesn't actually do anything to your ship made it worthwhile. 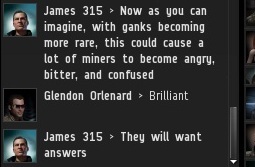 I should mention that the New Order enjoys it when you gank them, because they are just that emo. Make sure to use the kill rights at the best possible time! 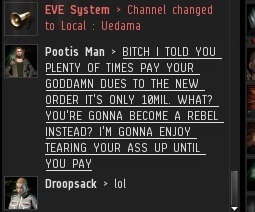 Loving the ship names on dscan! Two dozen bumpers working in unison, it brought a tear to my eye, such beauty. Wierd...I was there and you kept missing...losers. "Got bumped by some wannabe in a Thorax"
Uhh.. i guess it was me - sorry for bumbling bumping i promise improvement.